In our Spanish language learning lessons we spend some time exploring the differences between words that look alike or sound alike. In fact, these words are used in very specific, and separate, ways. When students practice their Spanish conversation skills, recognizing and understanding the differences between these words increases their comprehension level. Let’s clarify the finer points that separate these words. Here are five examples of similar, but definitely different, word pairs that may have puzzled you in the past. You probably noticed that some pairs are spelled exactly alike, or that only a single letter in a word changes its meaning. Sometimes it is the context of the sentence that tells you which word is the correct one. Understanding these often confused word usages is not the same as memorizing idiomatic expressions; by learning them you are attuning your eyes and ears to actual meaning differentiations. This is how you become truly bilingual. 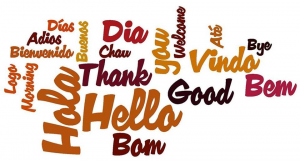 This entry was posted in Online Language Lessons and tagged bilingual, learn conversational Spanish, Learning, Spanish classes, Spanish conversation, Spanish language learning lessons. Bookmark the permalink.